Allen David Reed has had an epic journey through the Terrains, from Square to Infinity. Moving through so many Terrains during the course of his lifetime has given Allen a deep understanding of most of the Continuum of Terrains, direct from his own personal experience. Born half Mystic and half Scientist, Allen David Reed spent his earliest childhood at the Order-Based Terrain (Square), very patriotic and wanting to contribute to his society. Having a father at Pyramid, a mother at Square and a younger sister at Diamond created a very challenging family environment for young Allen. This caused him to spend much of his time alone in the woods surrounding his neighborhood, the pristine beauty of Douglas Fir forests. Allen was deeply intuitive and found himself having telepathic experiences with trees and animals during his time in the woods, that left him profoundly aware how we are all sharing one Consciousness. This experience of connection with nature left him struggling to relate to his family and relatives. Attending Square public schools at that time, Allen noticed the blatant disconnection between the authoritarian institutional system he was being ‘educated’ by and what nature was teaching him in the woods. At the age of twelve, Allen’s family moved from the beautiful ​wooded countryside outside Seattle Washington to the suburban blight of southern California, where nature was nowhere to be found. Dearly missing his connection with the forest, Allen now found himself thrust for the first time into the world of consumerism, where people were fixated on material wealth and status. Soon after, Allen shifted from Square to Diamond and began to question the world around him. Being a vastly curious child, eagerly devouring all sources of scientific thinking, the disconnections between Allen’s experience in the forest and the theories of modern science started to become highly apparent to him. Allen saw very early on the disconnection between civilization and nature, and became committed to understanding how to heal our division with what truly is another part of our ‘Self’. At this point, Allen set upon his life’s quest to reconnect and reintegrate our civilization with nature, as it was clear to him that this was the source of much of the pain and suffering he was seeing around him - including his own. Allen began to study all the world’s sciences and religious teachings during his teenage years. He quickly began to realize that much of what Humanity—in particular Western culture—believes to be real and ‘true’ was very much in error. In fact, it became clear to him that everything was literally the opposite of what we perceive it to be! This inquiry continued growing exponentially through Allen’s studies at University, where his thirst to solve this paradox led him to master architecture and engineering, social systems, ecosystems, global geopolitics and virtually everything else he could absorb there. Allen graduated from University with the distinction of being the youngest ever licensed architect in the United States. He began his career as an architect, builder, urban planner and environmental landscape designer, working in the US and Europe. He acquired firsthand knowledge of all facets of design, engineering, and construction, in projects ranging from smaller, mixed use, urban development to large scale regional planning. After taking some time off to travel through Europe, Allen came back to ‘Silicon Valley’ in California to further his career as a design builder, and soon became involved in the exploding technology boom of the 1980s. He became an early pioneer in artificial intelligence research and virtual reality, creating VR libraries that are still used today worldwide for simulation and visualization. During the 'dot com' era Allen acquired over twenty years of specialized expertise and experience in the fields of computer graphics, Artificial Intelligence (AI), programming, web commerce and design. As his knowledge and expertise grew, Allen also branched out as an entrepreneur, author and public speaker. Even as his career was unfolding, Allen remained driven to understand how we as a western civilization have gotten so disconnected from our natural selves and to discover what is needed to return to our innate wholeness. Being half Mystic and half Scientist, Allen continued to study everything he could in the western disciplines, including law, natural sciences and quantum physics. He also spent many years researching the ‘true’ physics and earth sciences and studying numerous energetic and vibrational healing modalities. In 1984, Allen joined The Foundation for Mind-Being Research, which brought together an alumni of the world’s most advanced scientists from institutions such as Stanford, SRI and Princeton. Like Allen, these leading scientists were attempting to reconcile the disparities of ‘modern scientific theory’ with an awareness of quantum non-locality, mind and Being. Allen served as the Vice President and Director of the Foundation from 1995 through to 2001. Allen shifted from Diamond to Circle in his late 30s, having been prepared for this many years earlier by his experience with the trees as a child. Yet his many long years before that spent at the Reflection-Based Terrain (Diamond) were Allen's time to explore the world of the mind, driving him to question everything presented to him by the mainstream Square world of the day. These years also helped him to learn to express his uniqueness and originality, after the strictness of his conservative Square childhood. Interestingly, over the 17 years he was involved with FMBR, as he moved into his thirties and then his forties, Allen shifted from Diamond through Circle into Spiral, and his relationship with the scientific material he was encountering there shifted dramatically each time. What was initially of great interest to his mind, came to be a felt experience of truth in this Heart, then a lived experience used to create his own reality. Along with science, Allen has also studied all aspects of global history, economics and politics, both the 'official' versions as well as the lesser known and truer accounts. As a keen student of life and human systems, he has also immersed himself in many psychological models including Astrology, Gene Keys, Human Design, Myers Briggs, Reichian Orgonomics, Timegnosis, and Wealth Dynamics. In his 40s, when he was at Spiral and then at Toroid, he went on to develop his own range of self-assessment metrics and models to help people come to know themselves more deeply and accurately, as well as models to understand our world. Allen had met a number of influential Gnostic thinkers in his teens when he was at Diamond, who had guided him to research more deeply into the esoteric knowledge of Consciousness and life. As an adult, as he moved from Diamond to Circle to Spiral and then to Toroid, Allen continued to follow the esoteric path and became deeply studied in the Kabbala and I-Ching, as well as in Sanskrit, Mayan, and Taoist lore. He explored the teachings of the world’s mystery traditions and secret societies of both the east and the west. Allen drank in the collective knowledge and Spiritual wisdom Humanity has gathered over its many tens of thousands of years - especially the indigenous cultures. Allen has been personally mentored by many of the world’s leading luminaries in these esoteric subjects, throughout the decades of his study. These include the Toroid visionaries Buckminster Fuller and Alexander Everett. Allen has also done years of intensive personal development work, as well as a great deal of shamanic journeying. He has had his heart powerfully opened by Pele—the spirit of the lava in Hawaii—and has studied with the Kahuna elders there. He has also studied and practiced all the major forms of divination, until he became the advanced intuitive and master dowser that he is today. When he was moving from Spiral into Toroid in his 40s, Allen stepped into greater and greater degrees of Self Responsibility, fully emodying the knowing that it is he who creates his own reality. In his early 50s, when starting to move from Toroid towards Infinity, he was tested on greater and greater degrees of trust and surrender to life and to the higher knowing of Infinite Consciousness. He drew Tahnee into his life at this time, and their relationship (initially romantic, later a deep friendship) pushed him to clear more and more of his childhood patterns and the dimensions that were activating from previous incarnations. He made the quantum leap into Infinity just before his 55th birthday, after a life-changing week of ecstatic spiritual experiences, and since then has been living in a state of surrender, finally seeing the perfection of All That Is. Yet even now, he continues to work on himself, to clear any charge force that remains within him, to free himself from any remaining conditioning, and to heal the last remnants of his emotional wounding, so as to come back more and more to the wholeness of Unity. Today, at Infinity, Allen is considered a highly intuitive mystic. He is an energy and alternative healer, a shamanic intuitive, and a master dowser fluently skilled in all of the major forms of divination. With his broad knowledge of politics, history, economics, science and philosophy, he is one of the few people to have put together the full picture of what is happening in our world. His colleague Tahnee fondly calls him ‘the walking encyclopedia’, because his range of knowledge is so vast. He has a genius for pattern recognition, problem solving and for seeing truths that others don’t see. As a consultant, he draws on his rich background of skills to advise people and companies on strategic thinking, innovation, and how to get their message out to the world. Allen’s lifelong quest to reconcile civilization and nature has proven to be the perfect crucible for curating the model of the Ten Terrains of Consciousness, and Allen is eternally grateful for having been given the honor to share this profound understanding. 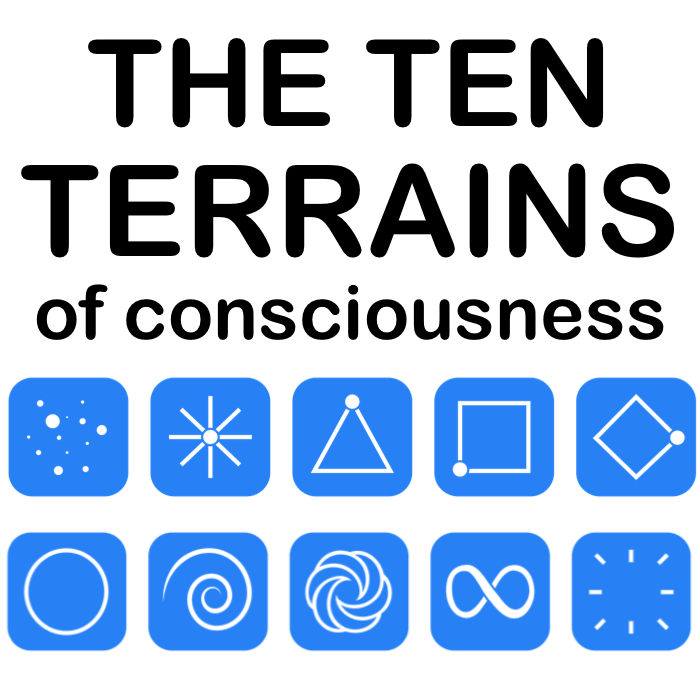 With his understanding of the Ten Terrains of Consciousness Model, Allen now has a very elegant and clear method to explain what is driving everything that is happening on our planet. Finally, after over fifty years of dedication and commitment, Allen has resolved the seeming paradoxes that he, as a child, was so very curious about. He hopes that this Model will assist people around the world to experience our natural birthright, which is to live a fully Sovereign life, living healthfully and prosperously.